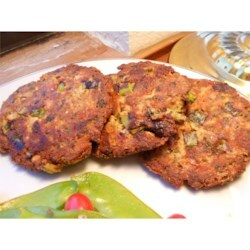 "Cheddar cheese and parsley add to the color and taste of these flavorful patties. My neighbor tried them and has been passing around the recipe ever since! " Combine salmon, onion, egg, bread crumbs, Worcestershire sauce, hot pepper sauce, black pepper, cheese and parsley; mix well. Shape into four patties. Dust lightly with flour. Chill for 20 minutes. In a large skillet heat butter and olive oil over medium high heat. Cook the patties until browned on both sides, about 10 minutes. Drain briefly on paper towels before serving. These are SO delicious!! I dusted the patties with parmesan instead of flour- it made them really crispy outside, tender inside. A new family favorite!! Very good salmon!! I baked mine instead of frying --much healthier!! Will make again!! Excellent. Baked them at 375 for 20 mins and then browned them in a pan. Used fresh leftover smoked salmon and used 2 eggs instead of one. Thanks for the recipe!